Encourage fair play with official, Signature Edition 24 Challenge Tournament Mats. 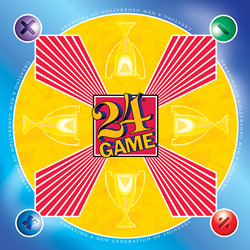 Card is placed in center square, players must keep their fingers on the "blue" area until they tap the card and offer a solution. Pack includes 8 colorful 10'' x 10'' mats, PLUS 60 2'' x 5'' Score Cards. MADE IN USA.